S/Sgt James C. Wilkes, Jr.
James C. Wilkes received his B.A. from Troy State Teachers College, his Masters from the University of Tennessee and his PhD from the University of Alabama. He was a member several university honor societies including, Phi Kappa Phi, Phi Delta Kappa and Beta Beta Beta. He helped found Dauphin Island Sealab, he was on the board of East Alabama Central Mental Health-Mental Retardation, Inc. and a member of the Kiwanis Club. Dr. Wilkes retired in 1986. He and his wife Pearl have 2 daughters Mardi and Karen; and four sons Jimmy, Chuck Peter, and Greg; 19 Grandchildren and 5 Great Grandchildren. Pearl passed away in 1989. He flew 22 missions as Radio Operator on Crew 43. 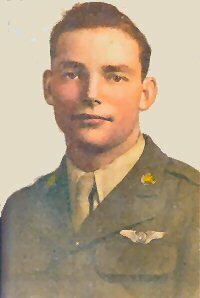 He earned the Distinguished Flying Cross, the Air Medal w/ one Oak Leaf Cluster, The Presidental Unit Citation w/ Oak Leaf Cluster, The American Campaign Medal, The Asiatic-Pacific Theater Ribbon with battle stars and the WWII Victory Medal. Dr. James Clayton Wilkes Jr. died at his home Saturday, Aug. 6, 2005 at the age 84. Services were held on 13 August 2005; he is buried at Green Hills Memorial Park.